Japan’s Car Top magazine has been informed in detail of Nissan’s secret test drive event held earlier this month at its Tochigi proving grounds. An unnamed test driver has spoken exclusively to Car Top magazine about an event held by Nissan to allow 30 people to test drive the 2008 GT-R at its Tochigi proving grounds earlier this month. No media representatives were invited to the event so the lucky group of people only consisted of Nissan advertising and marketing personnel as well as some racing and test drivers to help out with the program. Over the 3 day event, the aforementioned unnamed test driver was able to put the GT-R through handling and high speed tests designed to show its superiority against two other cars for comparison, a Z33 Fairlady Z and a 997 Porsche 911 Turbo. All those assembled were told that the interior of the GT-R test car was fake and that the black front mask would not be coming off for the tests. The rear of the car however was unmasked and there for all to see. 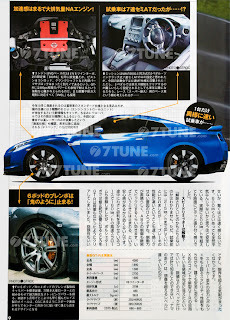 The unnamed test driver went on to describe the rear of the GT-R to Car Top and a CG image of that description can be seen below. There would also be 7 different GT-R models to be released (in different markets) and there would be four colors: the silver as seen on the Nurburgring test car, the gun metal gray as seen on the car at the Goodwood Festival, white and black.